On Saturday, the girls and I volunteered our kitchen and serving abilities, again to our church's monthly fund-raising tea. After the clean-up, the lady who coordinates the teas gave us enough leftovers for a couple of night's meals. making dinner on those nights was easy-peasy. Later in the week, I knew I'd want Thursday off from cooking duties, so I made a double batch of everything, on Wednesday. Maybe it was a bit boring to eat the same thing 2 nights in a row. But it solved the problem of how to cook when I wouldn't be home for much of the next day. I am trying to use up my saved fat in the freezer. The ham and bacon fat is always used quickly. Next easily used would be either the chicken or the beef. The least popular reserved meat fat is the turkey fat. So, I am making efforts to use that one up. The kale quiches had such a strong flavor, anyway, with the kale and onion, that the turkey fat flavor went unnoticed. I'll be remembering that the next time I cook some kale. My grocery bill went up by about $30 this week, and will go up again another $20. That's $50 spent, bringing me up to around $110 for the month, so far. I found sharp cheddar cheese on sale for $8.98/5 lbs. I bought 15 pounds. And I'll be stocking up on coffee tomorrow. Last week, I'd thought about buying coffee, but it was $6.99 a can at Fred Meyer, and that was more than I wanted to spend. So, I'd thought to myself that we'd just manage to get by with much, much less coffee until Senior shopping day in August, when I'd save 70 cents, at the least. Well, wouldn't you know it, coffee is on sale at Fred Meyer this week, same cans, for $4.99. By not buying any last week, I saved $2 per can. I like that! Coffee goes on sale in early fall, so I'll buy enough to get to then, and hope to find it on sale, on a Senior discount week, then stock up for winter. I resisted going out to eat on several occasions. Yesterday afternoon, coming back from errands and a stop by the beach, I was very tempted to buy a burger and fries. Then I thought, maybe just the fries. And then I talked myself out of both of those ideas, and into a peanut butter on whole wheat, with the last of the macaroni salad, and a sliver of the blackberry tart. It was a wonderful lunch, all homemade, and didn't give me a stomachache. I'm glad I resisted the take-out. What were the yummy things you ate this week? So, that's it for me for the week. I'm working on some Christmas gifts. Maybe I'll give you a peek next week, if they seem to be turning out okay. Have a great weekend! 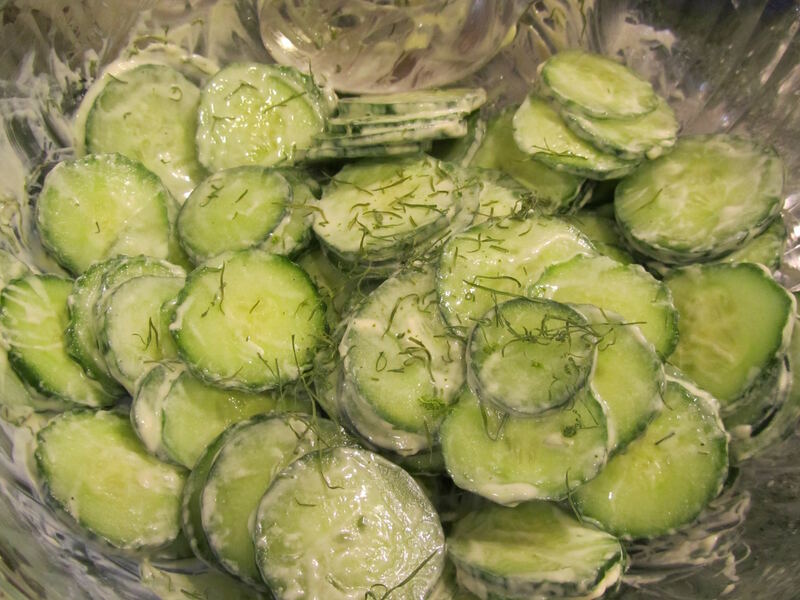 That cucumber dill salad looks wonderful. I'd like to try that sometime. Sunday--baked chicken, new potatoes, green beans, cole slaw, potato salad, chocolate cupcakes with chocolate mousse frosting. Family drove 4 hours to Cedar Point on Thursday as their last hurray before the family dynamics change. Daughter leaving the country to teach for two years, son will graduate from college in the spring, youngest is doing an internship this fall, traveling to Jordan just after the new year and more travel for her studies in the next year and a half. Things are changing and they wanted to do something before all this happened. I couldn't go since I'm in the middle of an audit for work. Your Sunday dinners always, always sound like such nice family dinners. Can I come for dinner? Oh, that's too bad you couldn't go with your family to Cedar Point. work, ugh! I hope they all had a marvelous time. My kids are in the same age-range as yours, and I feel the changes, too. One, moving into coupledom, and the other two, getting closer to entering their careers. Every time I plan a vacation, I'm thinking that there will be fewer of these, very soon. Lili, you just come on over for Sunday dinner, anytime! I change things around a lot to make things not so routine. Sometimes I haul a long oblong table outside under the tree. Sometimes, I set up a buffet table on the porch. Sometimes I use just plain cooking pans to serve out of. Other times I use glass beverage glasses sometimes just plain plastic tupperware. I like messing around with routine just to keep things lively! It's my son's 22nd birthday on Monday so I will make his favorite food on Sunday. Beer Meatloaf, mashed potatoes and cooked carrots! Then next week is my youngest child's 20th birthday so it depends on her work schedule I have to make something special for her birthday dinner. The yummiest thing we ate this week was a "mock" cucumber kimchee with watermelon rinds. That went so well in our bean patty soft taco, sprinkled with mung bean sprouts. No jalapeno or salsa needed just kimchee. Yum. We have two cucumbers left from the bounty crop so my husband is going to make another bottle. He can't get over how tasty the watermelon rind is. He loves it. By steaming it first, the rind could absorb flavors. Thank you for that tip. I used leftover water from the steaming in coconut gelatin...why waste any nutrients? Today I'm going to try making some basil tea with fresh basil leaves, since we're over run in basil. And try to use a past dated azuki bean paste (not in a can) to make mochi. Yesterday we shopped again at Target to catch some nice sale and coupon deals, and to pick up online orders at Wal-Mart and Lowe's (SYWR points rebate for partner shopping). We planned to eat lunch out, since it was my husband's birthday. I didn't make anything special, and likewise we'll do the same on my birthday coming up. He knows kitchen work is not easy for me, so that's how it has always been. On a good note, I am so pleased our grandson loves the cat clothes I made for him. Our DIL said he brings the cats, a different one each day, to preschool for naptime, and has gotten compliments on his cats in clothes. The best thing is he is happy and loving the positive attention. I should start thinking of making Christmas gifts too. I just don't have any good ideas at the moment, except that I am trying to teach myself more knitting techniques, so I am doing a variety of dishcloths to practice. Maybe some nicer ones could become gifts. Your lunch from home sounds much better than a fast food lunch. Waiting proved to be beneficial at least twice recently--once for lunch at home and once when buying coffee. I definitely want to see what you are making for Christmas.